It’s Monday again which means an exciting week ahead of us all! No need to hate on Mondays as it’s the perfect day to start something you’ve been putting off, make new resolutions and greet the new week with a smile on your face. So I hope this is what you are doing today. This week I am looking forward to some interesting events that I have in my schedule. Tonight I have been invited to a screening of a new season of HBO series ‘Girls’ organised by The Debrief website. I am such a fan of Girls that I can’t wait for the evening patiently any longer. Do you watch it? I have to admit I wasn’t sure if its my type of episodes during the first season as I’m sure you know it’s quite out there and has a lot scenes that made me feel uncomfortable. But quickly it grew on me mostly because I was so mesmerised by Lena Dunham’s talent and everything she did to make these series happen. I later watched it from the beginning again, this time with Patrik, and I think every season gets better and better. So my expectations for tonight’s episode are quite high. Follow me on Instagram (@julialundinblog) to see how it goes. I’ll tell you more about other events in my next post. I was quite inconsistent this autumn/winter season with posting season appropriate outfits as I have shot so much while in Bali and Abu Dhabi (which I haven’t even started showing you yet). So I have a few looks that I would like you to see. Starting with this post I promise to walk you through my current every day looks on a more regular basis. Same as last year I’ve been practically living in this black coat. It’s so versatile and can be styled in so many different ways. This season I’m a big fan of oversized coats, trainers and beanies. These Jimmy Choo trainers are my proud possession and even at home I can’t stop staring at them. Never would I have thought that I will have glittery everyday trainers, but I think the glitter is so subtle that it becomes perfectly daily appropriate. And this yellow Michael Kors bag has been with me since November and has brightened up a lot of my outfits already. Happy Monday, ahh sounds like you’re already having a good start to your week, if I went to a Girl’s screening I would enjoy Mondays too 🙂 Love the color of your bag, ties the outfit together so well! Love the bag and your sneakers! Such a cool look! 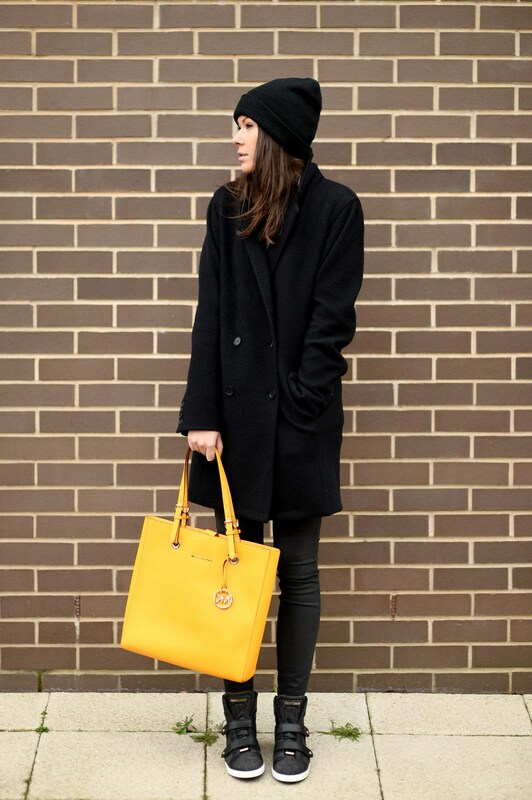 Love the all black look with the pop of mustard bag! The sneakers really polish the look! Super cute look. Love that there’s no wedge in that trainer. Sleek and modern.